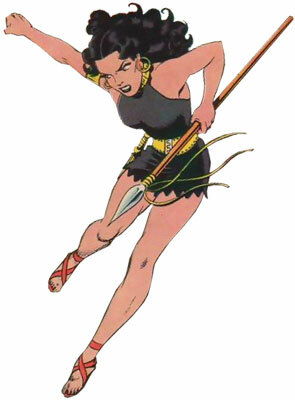 Jann of the Jungle is a fictional comic book jungle girl protagonist created by writer Don Rico and artist Jay Scott Pike in the anthology title Jungle Tales #1 (Sept. 1954), published by Marvel Comics' 1950s predecessor, Atlas Comics. Jungle Tales was renamed Jann of the Jungle starting with issue #8 (Nov. 1955). The series continued to issue #17 (June 1957). Since then, the character has made a handful of appearances, among them a non-canonical, alternate history story in What If #9 (June 1978). Jane Hastings grandmother was a woman named Jann who for reasons of her own relocated herself to the jungles of the Congo where she aided the various tribes that lived there. She became a revered person among the tribes and her heroics became the stuff of legends, however they are largely unknown. Jann had a daughter who begat Jane and raised her in the United States. Jane was told about her grandmother's exploits in the jungles as she grew up. Jane eventually joined the circus and became a trapeze artist and animal trainer. She eventually took those skills with her to Hollywood and earned a job working as a stunt woman on a jungle picture being directed by filmmaker Pat Mahoney in 1954. 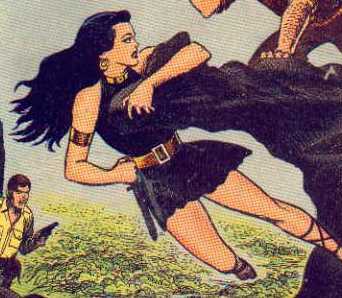 The shoot brought them to the jungles of the Congo where Jane did the stunts for the lead actress in the film. Shortly into filming the movie, the tribes people came to warn the cast and crew that the animals had grown restless and that they might attack. The tribes people also noticed a resemblance between Jane and her grandmother and began calling her Jann. Jane decided to adopt the name, thinking it sounded professional, not realizing that they were referring to her relative. Sure enough that is exactly what happened and Jane used her acrobatic skills to redirect the stampede of jungle animals. In the aftermath the tribes people told the newly christened Jann of her predecessor making Jane realize that they have been referring to her grandmother. Feeling like she had come home, Jane decided to abandon her film career and stay in the jungle and continue her grandmothers legacy as Jann of the Jungle. Pat Mahoney decided to stay behind as well to keep an eye on her and was her regular companion. Later Jann was sent by Pat to recover the rare red orchid from the Black Swamp. When the scent of the flower drove the local tribe mad with a jungle fever, Jann traveled into the swamps again to recover the even rarer black orchid to cure them. Later, Jann defended the jungle from the Screaming Terror a remote control robot constructed out of elephant bones under the control of a Communist agent seeking to take control of the region. Shortly thereafter, Jann saved a cub from a battle between two male lions. She then raised the cub, naming it Coga, much to the worry of Pat who warned that the lion may one day turn on her. That seemed to be the case when Coga grew to full size, however Jann revealed that the lion that attacked her was Coga's father coming to claim his son, and let Coga go free. Shortly thereafter, Jann and Pat exposed a communist agent named Krueger who was attempting to turn the local tribes against them. Later when Pat was at risk of being sent back to the States for a lack of sensational photos, Jann reluctantly agreed to take him to photograph the so-called "White Peril" a herd of albino rhinoceroses, but were forced to abort the task when the rhinos began to charge. Somehow Pat managed to keep his job after this blunder. When a local gorilla begins acting strangely, Jann investigates and uncovers that the ape was driven mad by a Communist spy who was attempting to keep his secret uranium mine a secret. Jann continued to be a protector of both humans and wild life in the jungle, often convincing the animals to relent in attacks on both the good and wicked alike. She went after Pat when he went searching for the so-called Lost River, saving him from the white lions that protected it, although Pat was struck on the head and forgot the experience and Jann convinced him that the Lost River was a myth to prevent him from looking for it again. She later discovered a group of radium miners who were using a local tribal idol to hide out and local superstitions to trick the locals into bringing them food, forcing them to share their wealth with the impoverished tribe. She also prevented a war between the Vappi and Robai tribes by exposing Kakouro -- the leader of the Vappi -- as a coward. Jann next discovered a pack of jackals that lured other animals to a nearby poisoned watering hole so that a strange flying lizard -- the source of the poison -- could feed on them, killing the creature allowing the water to become clean again. Not long after this, she and Pat also protected a massive pearl from being taken by a pair of scavengers. The pair also stopped a man named Keller from inflaming the local Kalu tribe into going to war against rival traders in the area. Searching for a large ape that was reportedly being aggressive, Jann discovered that its mate had fallen ill and brought it a jungle serum that cured it of the illness. Jann once more stepped in the middle of a brewing war between two tribes who blamed each other for poisoning a nearby watering hole. Jann discovered the real culprits were a gang of uranium miners who operated from a secret underwater cave who used a squid -- whose ink was poisonous-- to defend their find, slaying the squid to purify the water. While out with Pat again, both ended up falling into a deep pit where Jann battled the leader of a colony of massive lizards who then led them out to safety. Jann next stumbled upon a plot between Kabubi and a smuggler named Paulo who were attempting to inflame Kabubi's tribe to attack the neighbouring Makasi people in a bid to take over the jungle, and foiled this plot. She later rescued a white hunter who got lost in the jungles and went mad and prevented him from being trampled by elephants whom he angered by attacking. Attacked by a gorilla, Jann followed it and learned that it was searching for its lost child for his mate. Jann tracked the child's footprints and found that the missing child was a human boy kidnapped by the apes from his father while they were out hunting for butterflies. Jann saved the boy from a lion and convinced the apes to let her bring the boy back to his father. Jann later prevented Pat from photographing the Kobuki tribes worship of their fire god. However when a rhino stampede knocked over their idol, Jann was blamed and was briefly regarded as an enemy of the tribe. She then tricked the tribe into thinking the fire god favoured her then saved Pat from being trampled by the same rhinos that caused the trouble to begin with. When encountering an angry male lion, Jann searches for his mate and finds it was captured by a poacher calling himself the Professor. Jann with the help of the male lion freed his mate and forced the Professor and his men to surrender. Soon the jungle was over run with killer vines that incapacitated all the wild life. Breaking free from the vines herself, Jann tracked them to the source, the shack of botanist Gerald Thorn, who was hired by communist agents to grow the massive vines in a bid to take over the jungle, Jann destroyed Thorn's machines then forced him to show her the root system so she could destroy the massive killer plant and restore order to the jungle. Soon after this communist agents employed a woman to pose as Jann in order to trick the Azuzi and Bongi tribes into going to war to promote communist propaganda in the land. Learning of this plot, Jann faced off against her impostor, proving herself the superior warrior and exposing her imitator to the tribe, foiling the plot. The jungle was soon struck with a draught that threatened to make the local animals go mad with thirst. Things got worse when a swarm of locusts soon swarmed the region, but Jann was saved by a flock of pelicans who ate the insects and Jann was soon able to lead the animals to a new source of water. Shortly after this, Jann prevented a pair of would-be thieves who attempted to steal the gold from an ancient burial ground that was hidden within an active volcano. Jann soon became the target of revenge from white hunter Ward Blayne and his employer Mr. Jason after she caught them trying to hunt illegally, costing Blayne his job. After Jann rescued them from a herd of stampeding elephants, Jann ordered them to leave Africa and never come back. Soon Pat's photography earned the ire of the Bokubi tribe during yet another draught as they blamed him and his camera for it. Jann rescued the tribe from a herd of charging rhinos while Pat used an aircraft to stimulate clouds overhead to start raining, giving the tribe the needed water and allowing them accept Pat back in the area. Soon after, Jann caught a lion tamer named Carter from abusing lions and forced him to swear under the shadow of the totem of Karak to never hurt the animals again. Carter lied and attempted to get revenge against Jann and retake the lions, however when he shot at the totem of Karak it almost toppled on him had he not fallen off a cliff and was saved by Jann. Having had his life saved, Carter agreed to follow Jann's wishes. When Jann discovered that legendary hunter Moss Kane had lost his nerve when a savage gorilla was spotted in the area, Jann secretly helped Kane take down the gorilla, leaving him to think he did it all on his own and restored his faith in himself. Jann and Pat later encountered a massive leopard on the prowl in the jungle, when Pat managed to snap a photo of the big cat with Ned Mungo, an animal-hypnotist turned criminal, Jann prevented him from using the leopard to slay the officer who sent him to jail. Later when Jann and Pat discovered a rare black orchid, the pair protected it from a pair of fortune seeking poachers who almost became victims of the carnivorous plant. After stopping a scavenger named Carson from robbing an elephant graveyard, Jann soon became a victim of his revenge via a voodoo doll. However the magic in the doll was not meant to be used against evil beings and Jann was soon freed from its control. Mystically drawn to the doll, Jann saved Carson who was being choked to death by the effigy and he renounced his criminal ways and left Africa. Shortly after this Jann stopped a pair of would be diamond smugglers from escaping the jungle. Later she helped the worshippers of the golden god of the midnight drum get water back by opening up a reservoir that was dammed up by two crooks named Yancy and Bull who attempted to force the leader of the tribe to turn over their golden idol in exchange for water. In 1958, when FBI agent Jimmy Woo was gathering super-humans to be part of his G-Men to battle the international terrorist Yellow Claw. To this end he sought out Ken Hale who had sought seclusion in the Congo jungle after being transformed into the Gorilla Man. To this end, he sent the Uranian super-hero Marvel Boy to collect Hale. In the jungles he was assisted in his search by Jann, and working together the pair succeeded in locating and recruiting the Gorilla Man into the ranks of the G-Men. Jann is an experienced survivalist and fighter. Jann appeared to have an affinity with animals, being able to communicate and understand them in rudimentary ways and her actions often influence hostile animals to become more friendly. However this may have just been interpretive skills she gained from living in the jungle as opposed to any super-human abilities that allowed her to communicate with animals.